1. Water supply to top floor water tanks of villas,residences ,apartments ,households and buildings. 2. 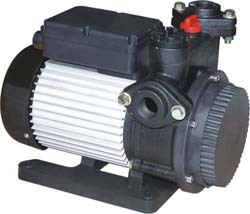 Water circulation for industrial equipments. 1. Silent operation for promoting standard of living. 2. Aluminum alloy motor shell for lowering motor running Temp. , while it’s running continuously. 3. Stainless Steel Volute impeller design for great water capacity and resist wear. 4. High efficiency for saving resource cost; Easy installment and dismantling.